A new threat endangering the whole known world, appears in the form of hordes of beasts with grotesque, monstrous proportions. It is called the Legion, because ranks of the invaders seem to be countless. Servants of the Legion emerged recently. At first, this bizarre creatures were seen only in far North. 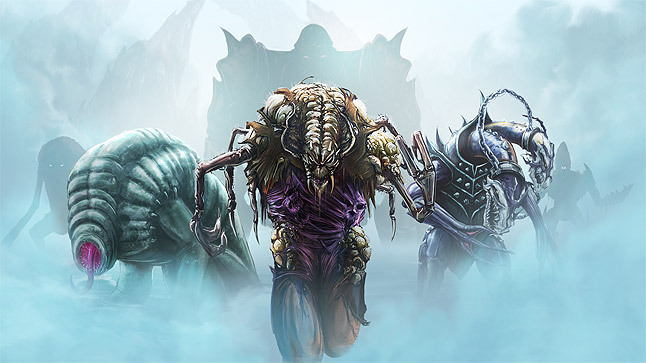 However, still more and more mutants (as they are also called) reach Larium and Daaroth continents. Purposes of the Legion are unknown. Wherever the mutants arrive, they are accompanied by death and conflagration In the beginning everyone was sure that the beasts are driven only by hunger and bloodlust. Not before after some time, the military commanders noticed that actions of the mutants are too well-coordinated to be considered only a raid of wild beasts. The new enemy is more like an army. Origin of the mutants is shrouded by mystery. However, all tracks lead to a small island of Tamrel. Expeditions of all races head exactly to this location now. Nobody knows, who is the mastermind of the Legion. Whoever they are, they have a powerful army at their disposal. It is also sure that a spy network recruited mostly from intimidated inhabitants serves the Legion. The individual Legion Generals are free to decide while choosing their actions. In spite of the fact they serve the same master, there are many animosities between them. The support they provide to one another is only fictitious. The Alliance decided to exploit this weakness of the Legion, by spreading gossip intended to intensify the antipathy and hatred between the Generals from time to time. The leaders of the Alliance hope that spies will convey these rumors to the Legion Generals, causing internal fights between the forces of the Legion. The bottom of the hierarchy consists of simple soldiers. The have no rights but to die in the name of the Legion, whenever it is needed.